My Mom was ecstatic with this trellis. It’s built well and anchors into the ground. This is important as we face strong winds and weather in Florida. So easy to assemble! 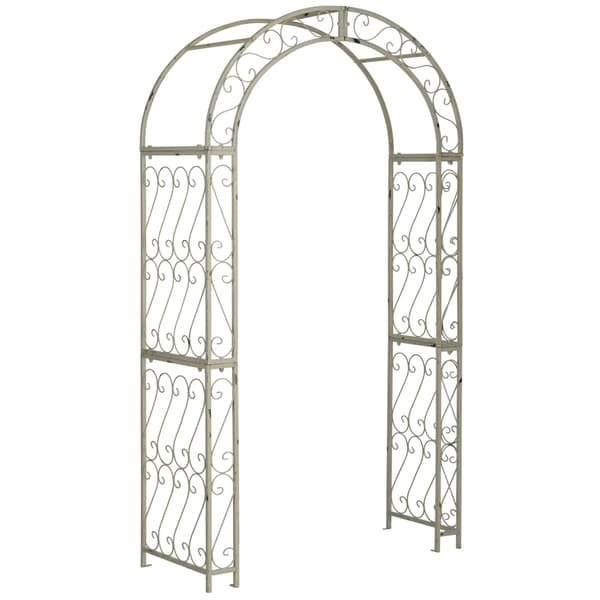 Imagine the entrance to your own secret garden framed in a trellised antique white arch. A distressed white finish makes this arch look as though it's been a part of your garden for years. The Victorian filigree makes this masterpiece of ironwork as pretty in winter as it is during the peak flowering months of summer. Very happy with my purchase of Safavieh Antque White Arch. The Archway is easy to assembly but took longer than 10 minutes than the directions stated due to the bolts being attached to the parts so you'll have to unscrew them first before you can assemble. The directions were decent but a little unclear for me on where to use the supporting bar with bolts as these were not labeled for arch. Product and packaging arrived in good and all parts where included. The only question was the manual stated two (2) spare caps were included but only one (1)was received so I don't know if the information is out of date or I'm missing one. Love this arch. Put it over my walkway and planted morning glorys to grow up over it. Very pretty. I would recommend buying this product. You will enjoy it. I purchased three of these and found that two of them had parts missing. The third one had a part so badly damaged that it could not be used. The paint job is very bad as well on all three. There was a tremendous amount of chipping and scratching to the point that I had to totally repaint all three arches. I'm very dissatisfied with all three but I needed them for a display so I didn't have time to return them. I'm hoping that they can supply the missing parts for me. I've had this arch in my south Texas yard for over a year and it looks as great today as the day I installed it. It works great as a trellis for vines and is very pretty. very disappointed poor quality looks like black paint was splashed all over. Certainly not that antique look ! beautiful! used this for our beach wedding- as a back drop- it looks so lovely in pictures :) highly recommend...great quality for the price! total junk, missing nuts, bolts AND brackets for assembly; drill holes missing for proper assembly, unbelievably bad. Customer Service however was AWESOME about it, appreciate that very much, total satisfaction with the return process to make it right. This arbor is just what we were looking for. We are going to put it in the corner of our back yard with a winding vine with flowers that will grow and entwine all over it. So when we have company and sit on our deck, what a beauriful sight to see. We will be the envy of the neighborhood. Will I tell them where we got it, you bet ! well..it was very easy to assemble, and it seems sturdy enough to withstand years of outdoor climate - it replaced a wooden grape arbor that had rotted away.... hope that helps..i am going to buy another one to replace another wooden arbor that is done..
Its more amazing than I even expected it to be. Assembled easily, Is not to heavy and looks mold just like I needed it to. Thank you so much. Would never buy this item again and would not refer it to a friend. Some screws were missing and the ones there were painted shut. By the time we were done putting it together, (using some of our own screws) the paint job was so bad we had to spray paint it. I am not happy with this purchase. "What are the width and height total dimensions of this item?" The dimensions are approximately	84" inches high x 48.5" inches wide x 48.5" inches deep. It's pretty and appears to meet my need. Hopefully this will go in my garden - after reading the reviews I am a little worried. Trusting for a good product!